How often do you ride the T? Would you ride it more if you were required to pay for it? A proposed plan that would require all students and employees to pay $10 monthly for unlimited local subway and bus service has touched off a minor firestorm. However, even if approved by MIT, the plan is unlikely to have any possibility of implementation until the end of 2007. Although under a quarter of undergraduate students participate, MIT already has a substantial T-pass subsidy program, providing over 50,000 passes a year at half-price to students, faculty, and staff. Last fall, former Department of Urban Studies and Planning graduate student Ursula Hester MCP ’04 laid the groundwork for a possible “Unlimited Access Pass Program” (or U-Pass plan) as part of her Master’s thesis, with support from Frederick P. Salvucci, senior lecturer in the Center for Transportation and Logistics and former Massachusetts transportation secretary. 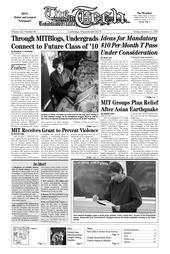 Reactions to the proposal ranged from support to complaints of unfairness after Andr a E. Schmidt G of the GSC Housing and Community Affairs committee initiated discussion of “Potential large changes to T-passes at MIT” over GSC e-mail lists in late September. While some respondents likened it to mandatory health insurance and argued that it would be beneficial to the community overall, others called it socialism and emphasized the new cost burden on those who rarely took the T.
All the controversy may be premature; according to Hester (who now works as a member of the MBTA advisory board), the MBTA would be unlikely to introduce a new fare structure for students before they finish upgrading their fare collection system to the Charlie card, scheduled for the end of 2007. One possible implementation of the proposal might be the integration of Charlie-card capabilities in the MIT ID card, allowing cardholders to swipe the ID’s for access to the T.
Posting to the same discussion list, Michael Hanowsky, head of the GSC Safety and Transportation Committee, wrote that both MIT and the MBTA had expressed interest in potentially implementing the proposal. Hester suggested several speculative pricing models. Under the local plan, every student and employee would pay about $10 (compared to the current $35 under the T-Pass program) to get the equivalent of a “Combo” T pass, which allows unlimited travel on local bus and subway services), while the university would pay a lump sum to the MBTA of about $1.5 million, about the amount MIT pays with the current T-Pass program. Plans that included Commuter Rail access would cost more per person, but still under $20 monthly, with several possible models for how the additional cost would be distributed. The proposal would effectively ask the MBTA to allow MIT to redistribute the access that MIT already buys for specific subscribers to all students and employees in exchange for increasing MBTA ridership. Each student or employee would pay significantly less than they do now ($10 vs. $35) for the equivalent of a “Combo” T-pass; in order for the program to be cost-effective however, every student and employee would have to buy into the program, with a few exceptions (say, in case of physical disability). Reached by e-mail this week, Hanowsky denied that there was any proposal in the works, emphasizing that “the U-Pass or universal access pass has *not* been discussed by the [GSC safety and transportation] committee,” and that “we need to do more research and thinking about exactly how students will benefit” before initiating any formal discussion. Schmidt was “unable to comment on the state of this project” at this time. Currently, the MIT Parking and Transportation Office receives a discount of about 11 percent from the MBTA when it buys passes in bulk from the corporate and semester T pass programs for employees and students, respectively. In Fiscal Year 2005, it spent over $3.5 million on T passes, which are resold to willing members of the MIT community at half the face-value price. Therefore, in actuality, MIT paid approximately four ninths of the $3.5 million. The T-Pass program is funded by the Employee Benefit Pool for staff and General Institute Budget for students. Of the 5000 or so T passes distributed this month, almost 2700 went to employees, while over 1200 went to graduate students, and slightly fewer than 900 went to undergraduates. So what’s in it for MIT? Larry Brutti, operations manager for the MIT Parking and Transportation Office, cited three reasons for the subsidies: City of Cambridge demands to reduce traffic congestion (mandating that MIT provide public transportation subsidies in exchange for permits to construct Simmons Hall and the Media Lab expansion), the limited availability and cost of providing parking spaces on campus (limited to about 4000 by the City) and “doing our part for the environment.” Improving the quality of student life by enhancing access to off-campus destinations was not cited as a reason, although it may be a fortunate side effect, he said. A number of colleges across the country have instituted universal pass programs over the past 10 years, providing students with universal access to public transportation at prices comparable to what has been proposed at MIT. For example, the Chicago Transit Authority has offered a U-Pass plan since 1998, and Northwestern University and a large number of Chicago area colleges participate.